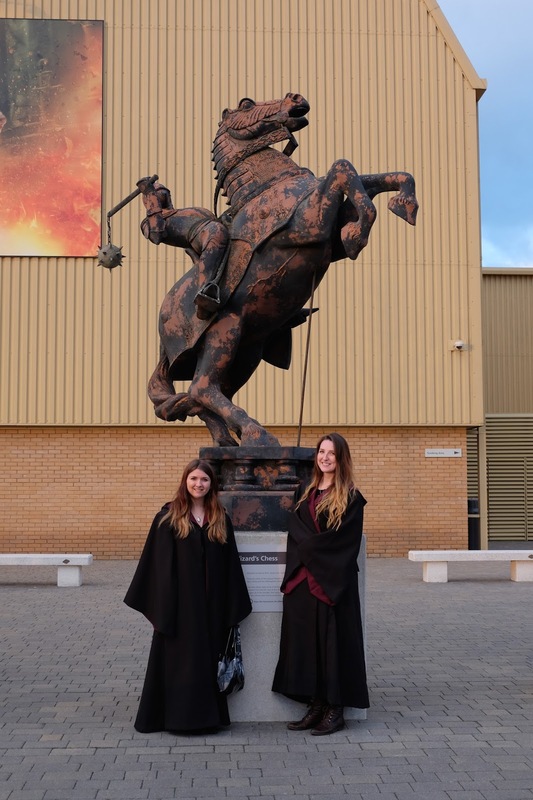 For my sisters 18th birthday my mum took us to the Harry Potter Studio Tour! We went there when it first opened back in 2012, but as I was the only current Harry Potter fan in the family and my brother was about 8, so we weren't really there long enough to see everything as he got bored pretty quick. And yes. We went in our Harry Potter robes! Boy! Has it changed since it first opened! How can anyone spend 5 hours just looking at stuff...?! Well, let me tell you, there is far more to it than that! Yes, there is loads to look at, everything from costumes, to sets, to props, to wigs, to prosthetics! Literally everywhere you go, there is something to look at. The sets are incredible to see, being a huge Harry Potter fan myself, to see it stem from book to movie to right-in-front-of-your-face is somewhat amazing. I want to be able to say that I have a favourite set - but they are all so familiar, I literally can't just pick one! I think I would obviously have to say The Great Hall is up there, Dumbledors Office is pretty amazing - there are things that you don't even get to see throughout the whole movie! The attention to detail is breath-taking! Also I think the set at the Malfoy Manor with Charity Burbage levitated above the table is pretty impressive - as sadistic as it may seem, it is very striking, and was a new addition from when I had previously visited. Platform 9 3/4 was amazing. This is something else they have added since the first opening, and boy - its impressive! The train allows you to walk through it, and the compartments are labelled as to what movies where shot in that particular one. There is also a trainside giftshop, which had some lovely things in it! Alongside a sweet trolley! What more could you want?! It's also far more interactive now, they have Hogwarts Passports for children (even though, my sister, my mum and myself ended up with one each) that they get to stamp with an embellishment at different points throughout the tour! They're a lovely little keepsake. The staff around the Studio Tour are wonderful to talk to - I spoke to one particular member of staff who had actually been in the movies! Yup! You read it right! He was one of the Death-Eaters in Harry Potter and The Goblet Of Fire! LIKE WOW! That's insane! He was pretty proud of it, and to be honest I can't really blame him. The staff are so willing to chat and can tell you loads of stuff when it comes to HP trivia. I highly recommend having a chat with them as you go along! Buckle up and hold on tight to your Nimbus Two-Thousand! There is also the broomstick riding! This was there when the attraction first opened - however it was no less fun than it was the first time! You have the opportunity to buy photos and also the video that they film whilst your flying over the streets of London! And then of course, there's the food court! By this point we were starving. They have something for pretty much everyone - and then there's the Butterbeer. And... the Butterbeer Ice Cream! Okay, so if you've never had anything Butter-beery before (which is unlikely unless you've been to one of the HP attractions as its only sold 3 places across the globe) its super sweet, 'buttery' so to speak. 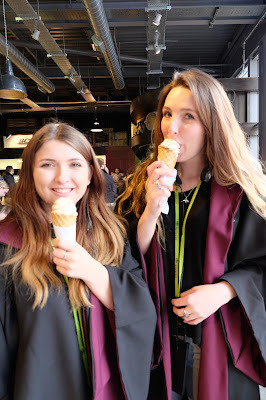 So if you haven't got a huge sweet tooth, I recommend maybe sharing a butterbeer or having a spoonful of someone else's ice cream (in your own party of course, don't go round sticking your spoon in other peoples ice cream - we're Brits after all, you might find yourself in a critical condition - we love our HP ice cream) it's defiantly worth a try, as it is lovely, and you're not going to be picking it up from Sainsburys anytime soon! The creatures side of things is amazing! I always had an interest in doing something along those lines as a career, but I'm no way near as talented as you need to be to complete something like these pieces of art! You can see everything from Dobby to Buckbeak to goblin faces to giant spiders to a very 'petrified' looking Hermione! They are all so life-like it makes you look twice! They are incredibly impressive, and I would love to give prosthetics a go one day, not to say I'd be any good! Finally you come to the end of the tour - and you are greeted with Hogwarts itself. There are no words to even begin describing what its like to see Hogwarts before your eyes. Even if it is a scaled down version (obviously it is, it would have cost thousands to build the real Hogwarts for the movie!) its still huge! There are twinkling lights in the windows, moss and grass over the grounds - its amazing. You wont understand until you see it for yourself! At the very end, just before the gift shop, there is a huge room filled with wand boxes. This room acts like the credits. Every single individual that was involved in the making of Harry Potter, has their name printed on one of these boxes. We have a family friend, whose daughter played Hermione's body double in the first two films - her name was on a box too! Its a wonderful legacy for everyone! Talk about Aladdin's Cave! If you're on a budget, let me tell you you're guna struggle! Eventually I only left with a chocolate frog - I get these whenever I go to any Harry Potter venue, srummy - and a beautiful little wrist watch. I love small watches, but they aren't in fashion at the moment, so it's incredibly hard to get hold of one I like. But this gorgeous little watch suits me perfectly, I hardly notice I'm wearing it, and I get loads of compliments and it doesn't initially look like a Harry Potter watch until you look at the top of the face. My mum and sister on the other hand, ended up leaving with a Dobby necklace each, my sister brought a chocolate frog and mum brought a few bits and bobs for my little brother. So there you have it, I've crammed (and lectured you) about my sisters brilliant 18th birthday treat! I hope you enjoyed it! And I'd love to hear about your Tour experience! Ahhh im so jealous I would love to go to Harry Potter world! It's amazing! If you ever get the opportunity! GO!